There are some hotel rooms across the globe with staggering views. In the UK, the penthouse of the Corinthia Hotel offers beautiful views of the River Thames and the London Eye. In Europe, The Plaza Athenee Hotel in Paris boasts rooms with stunning, unobstructed views of the Eiffel Tower. And across the world, the Oberoi Amarvilas in India has vistas of the Taj Mahal, and guests at the Four Seasons Sydney can look out to the Sydney Opera House. However, the humble Travelodge has managed to trump them all, with what has to be truly the best view in the world, from the top of the Ben Nevis mountain! 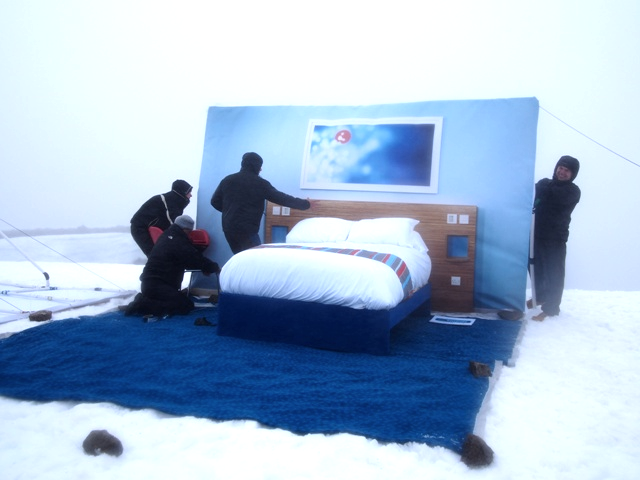 While it may be difficult to believe, it is indeed true that a Travelodge team of 38 professionals hauled all the components of a classic Travelodge double room up to the summit of Ben Nevis’s 1,344m peak. After this arduous task they set about arranging the room, giving weary climbers a great place to rest at the top, and a perfect spot to take in a magical view from the comfort of a soft Sleepeezee Dreamer double bed. Sadly, Travelodge only held the top spot when it comes to hotels with a view temporarily, but the ultimate ‘room with a view’ has left a lasting impression. This unbelievable feat of imagination and endurance managed to raise an amazing £40,000, including a £5,000 donation from Sleepeezee, for Macmillan, the well known cancer charity – meaning that many more will benefit besides the weary climbers on the day. Macmillan does tireless work supporting cancer sufferers and their families, and there couldn’t be a more deserving charity for Travelodge to pledge its support to. So much so that Travelodge staff have been involved in thousands of fundraisers for Macmillan, over the past two years, raising over £250,000 in the process! While building a hotel room at 1,344 metres above sea level is nothing sort of an incredible achievement, the amount raised to help enable Macmillan to continue its good work is the real miracle – and worth much more than even the most breathtaking view in the world.